Traditionally in technical analysis, chartists consider moving average indicators as lagging ones. In other words, these indicators are able only to confirm long-term trends that already started but not to predict in advance. The difference between simple moving average (SMA) and exponential moving average (EMA) is not so big in that respect although exponential one assigns more weights to the latest points and, therefore, EMA is more sensitive to the latest changes. A more “predictive” signal can provide a combination of EMA with crossing price curve. Normally, it is used as an affirmation of increase in momentum but, still, the disadvantage of using this combination is that a significant move may have already happened. Therefore, if the trend is not going to last long, traders risk to enter a position too late. Recent research showed that the predictive abilities of some well-known indicators can be improved by an additional transformation. Briefly, if an indicator is trend-differentially coupled with price – it demonstrates better predictive abilities than a simple indicator. As experiments showed – a similar improvement occurred when EMA indicator has been transformed to a slope of line and differentially-coupled with a price line slope. 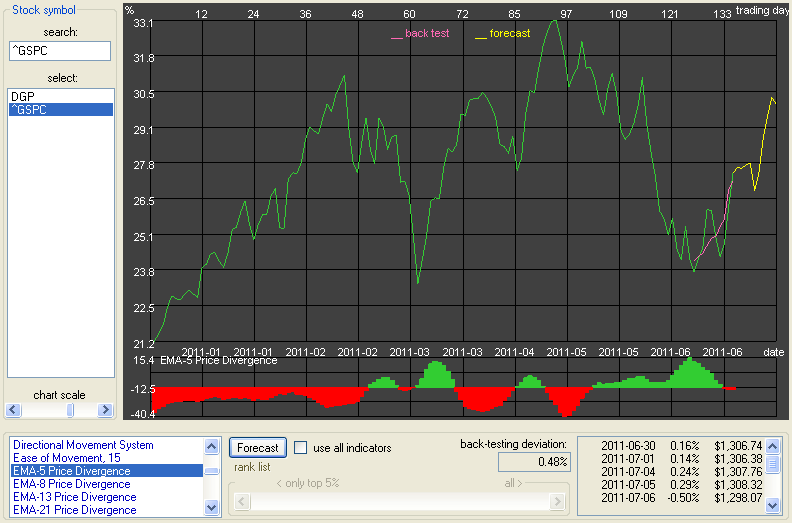 The image below shows EMA divergence indicator forecast by Technical Analyzer TA-1. This interface represents one of three major modules of TA-1. The module provides with more than 50 popular technical indicators. Except chart analysis, indicators can be used as input for Neural Network to build 10-day price forecast. There is an option to compose forecast from all indicators – each indicator’s forecast is added with the weight proportionally to the current ability of the indicator to predict prices.